The famous Cupertino school district is the site of new home community Kentwood place by Braddock & Logan Homes. This Bay Area developer has built over 33,000 new homes, 3,000 apartments and 355,000 square feet of retail and commercial properties since its founding in 1947. Despite the fact that Kentwood place town homes located in San Jose south of Kentwood avenue at the northwest corner of highway 85 and De Anza Boulevard, the kids from this neighborhood would attend Cupertino school district schools. Price for new town houses of Kentwood place Cupertino development begins from the mid $800,000's. 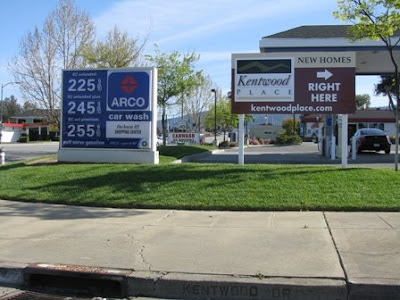 Kentwood place townhouses are within the Cupertino Elementary School District and the Fremont Union High School District. Based on attendance area for these school districts, students generated by the development would attend Lincoln Elementary School, Lawson Middle School, and Monta Vista High School. In addition to newly built homes and high ranked school Kentwood place San Jose offers easy access to almost all amenities of Cupertino and West San Jose within short drive. There are plenty of stores and restaurants offering ethnic food like located within walking distance from Kentwood townhouses Maxim Market. Different types of food stores like Lucky supermarket, recently opened Trader Joe's, Tin Tin Market, Kumud Groceries, Marukai and Marina Food wait only a short car ride away. For entertainment residents of Kentwood place could visit three-level Cupertino Square Mall (formerly Vallco Fashion Park) with AMC Theatres and Strike Bowl, Rancho San Antonio County Park and Stevens Creek County Park for jogging and hiking. Does anyone know about traffic noise in Kentwood Cupertino from highway 85? residents of Kentwood Ave have had rat and feral cat problems because of the nearby supermarket. Traffic noise is very bad. The worst part is the view of cars buzzing by your window. Located next to a gas station and a grocery store makes the place more unbearable. I stood in 3 of the units for 5 min each a got a headache after. How about pollution? Looks like no one worry about pollution. Lots of reseach said Living by Freeways May Affect Kids' Lung Development. Is that true? That is really my big concern. The noise could be ignore with windows closed during the day but definitely audible in the night when you are about to sleep. No idea about the air pollution but you can imagine. The home is on the top of the hw85 and with minimum space for plants in the whole community.